My coughing and the nice company of Paula, Sten-Olov, Björn and Johan made us decide to postpone our departure from Sweden. So once again a big big big thank you to all of you for letting us stay at your house and enjoy your company. When I woke up this morning I found out that my dry coughing was a lot better so I guess it was a good decision to stay an extra day. Paula’s son Johan spent hours to teach me a lot of the basics about how to set up blogs. He will see what he can do to improve this blog to both look better and get the functions we want to have. So I didn’t only recover from my coughing, I also learnt a lot. Yesterday Sten-Olov offered, or perphaps I should say, insisted on driving us the 10 km to the ferry terminal. I must say it was really tempting and although it is not a matter of principles for us to ride with an unbroken wheel track all the way to Bangkok, we decided to decline the offer. It was only 10 km to the terminal, the check in time was 8.00 and it took us 37 minutes to ride there in a wonderful morning sunshine. So it was another good decision, but we really appreciated Stens kind offer. There are very few passengers on the ferry today. Not all restaurants are open and those that are open only keep a small section open. I guess it looks completely different during the high season period. It has however been a calm journey over the Baltic sea with no waves, a good breakfast and wifi onboard. We have used the internet connection to select and memorize the best road from Gdynia ferry terminal to our next hosts and now we look forward to night ride through Gdynia. This entry was posted in Posts in English on February 28, 2013 by admin. – พอเราขึ้นเครื่องบินไปเมืองไทย มีคนมาเสริฟน้ำ อาหาร นอนหลับพักผ่อน ดูหนัง และพักผ่อนอีกหน่อย ตื่นขึ้นมาทานอาหารเช้า และอีกไม่นานเครื่องก็ได้เวลาแลนด์ หลายครั้งที่สงสัยว่าเราบินผ่านอะไรไปบ้าง? This entry was posted in Posts in Thai / โพสต์ภาษาไทย on February 27, 2013 by admin. The car is sold and the apartment is rented out. 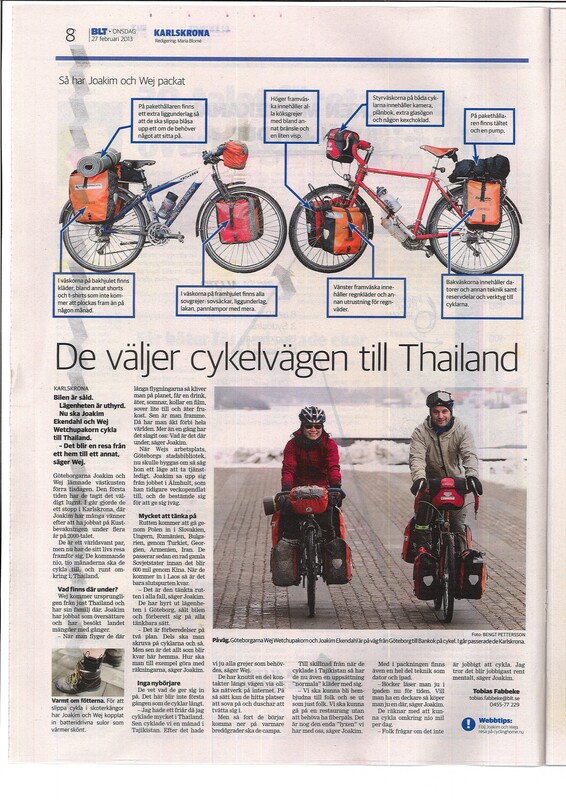 Wej Wetchupakorn and Joakim Ekendahl have now started to ride their bicycles to Thailand. Wej and Joakim left their home in Göteborg on the westcoast a week ago. They have been riding slowly the first part and yesterday they made a stop in Karlskrona where Joakim has many friends after having worked at the coastguard for several years. They are used to travel but now they have the journey of their lives in front of them. The coming 9-10 months they will cycle to and in Thailand. 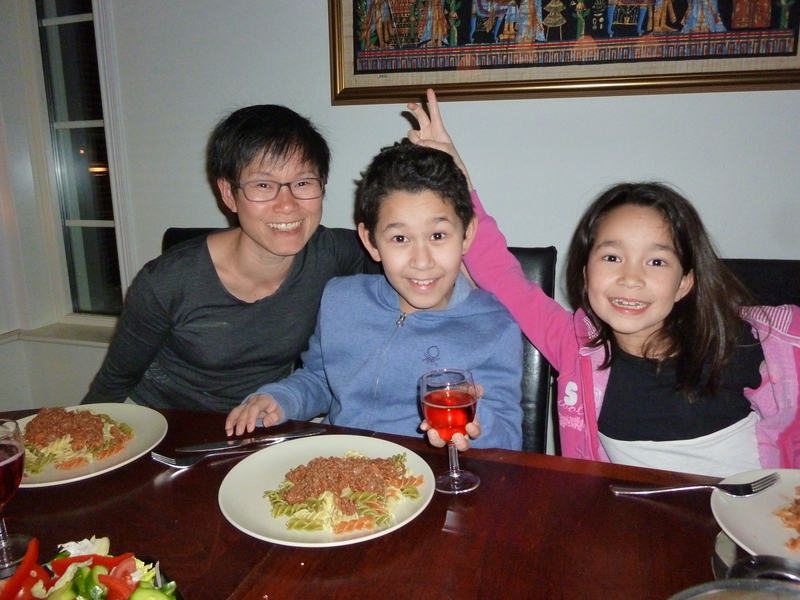 Wej comes from Thailand and has her family there. Joakim used to work in Thailand and has been there many times. 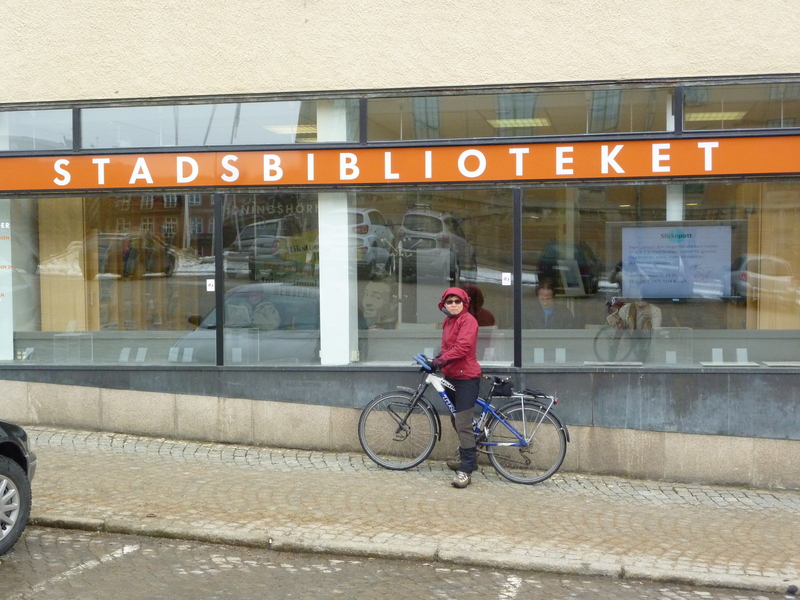 When the city library in Göteborg where Wej works closed for major renovations she applied for a leave without pay. They decided to go and Joakim left his job in Älmhult which he commuted to before. The route will take them through Poland, Slovakia, Hungary, Romania, Bulgaria, Turkey, Georgia, Armenia and Iran. Then they will pass a number of former soviet republics before they will face the 6000 km through China. When in Laos it will be like the last sprint to the finish line. They have sublet their apartment in Göteborg, sold their car and prepared themselves in many ways. The preparations have been on two levels. One level is the equipment and the trip itself, and the other is for everything that is left at home. Like how to pay bills, says Joakim. They know what they are doing and it is not the first time they go for long distance cycling trips. Wej have had another long leave without pay and spent it cycling around in Thailand. 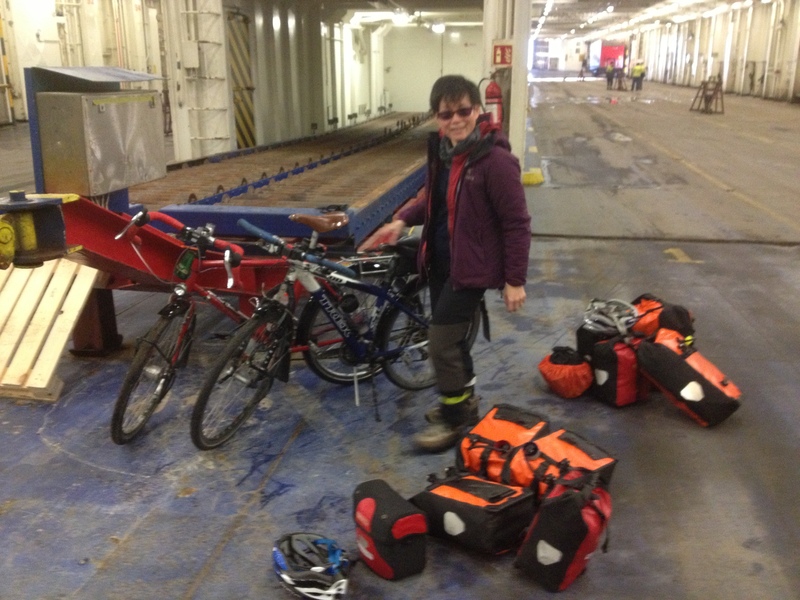 Then we cycled for a month in Tajikistan and after that trip we had all the equipment needed, says Wej. They have made contacts with local people along their route through various networks so that they can find places to shower and sleep. As soon as they will get to warmer areas they will start to camp. In contrast to the trip in Tadjikistan, they will this time carry a set of normal clothes. – We want to be able to be invited to people’s houses, go to restaurant and be among “normal” people and be dressed in normal clothes and not functional outdoor clothing. This is probably the only luxury we allow ourselves, says Joakim. In their luggage there is also some electronic equipment like computer and ipad. Books can be read on the ipad these days, says Joakim. They estimate that they will cycle about 90 km a day. People ask if it won’t be physically exhausting, but we believe it will be more of a mental challenge, says Joakim. The boxes in the pictures above show what is packed in each pannier. This entry was posted in Posts in English on February 27, 2013 by admin. I have worked in Karlskrona for 6 years before joining IKEA and this means I have lots of friends and former colleagues here. Yesterday evening we had a wonderful dinner at my friend Alexander and his girlfriend Karin’s house. Karin had to leave to work her night shift at the hospital but we sat up late and had interesting discussions with Alexander. 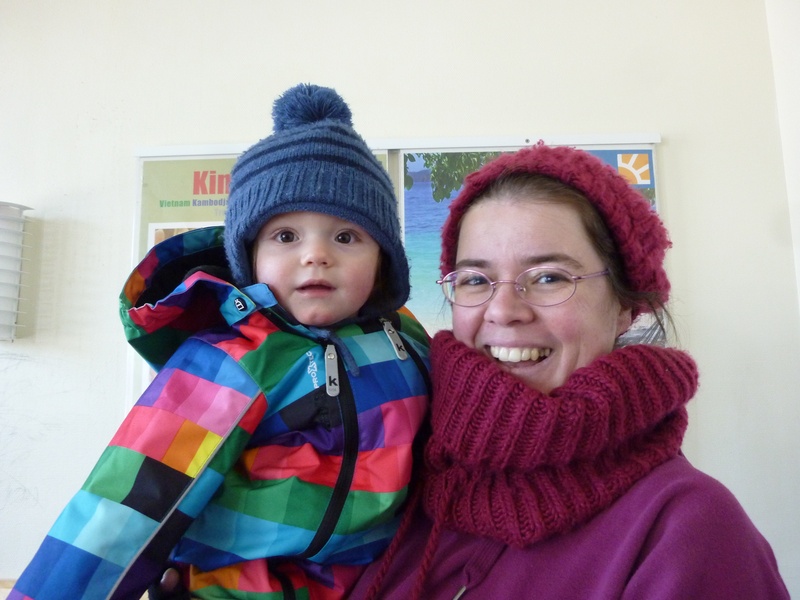 It was so nice to see each other again and we want to say thanks a lot once again to Aili, Karin and Alexander. 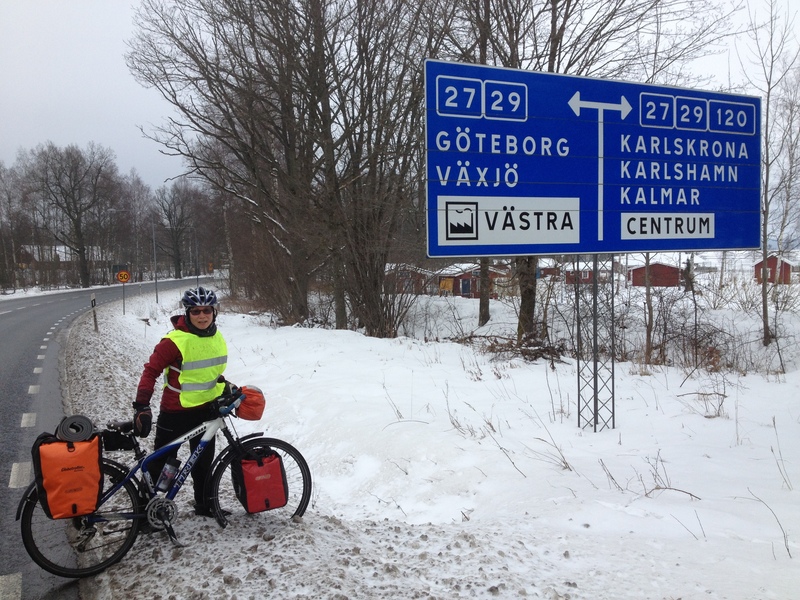 The ride from Alexander’s house to our next host Sten-Olov’s house is 3,5 km. Although being a very short distance we actually carried all our gear and did a transport from one place to another a little bit closer to Bangkok. I can’t make up my mind whether this should be considered to be as a “day in the saddle” or something else. This is a bit of a dilemma that we’d better work out since it will happen many times again. 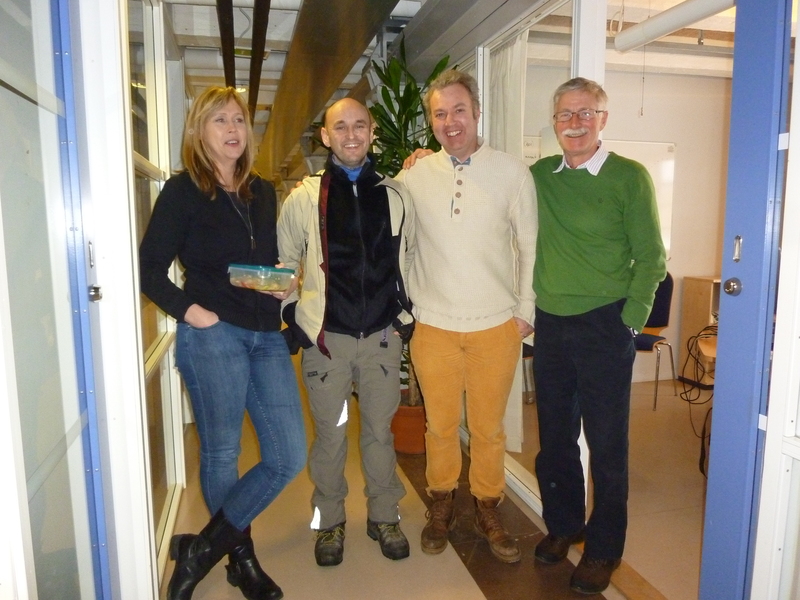 This morning we had an appointment with journalists from the local newspaper here in Karlskrona. They will make an article about us and our trip and we had a cup of coffee with them while trying to answer all their questions. They took lots of photos of us and our gear and soon we will be real celebrities. First a radio interview in by the local radio station back in Göteborg and now this interview by the local newspaper. And don’t forget that we had to write our autographs to an impressed pizzeria owner in Falkenberg. We will soon have to find a manager who can deal with all the media coverage 😉 😉 But trying to be more serious again we both think it will be very interesting to read that article and I hope we can link to it our put a copy of it here on this blog later. We also got new bikes today. At least it felt like that after dropping all our bags at our next host’s house. When we continued to cycle our bikes felt extremely light, lively and responding in the same manner like a brand new carbon super duper road bike. I used to work for the Swedish Coastguard’s HQ here in Karlskrona and after seeing the journalists we dropped by and said hello to some of my ex-colleagues. I haven’t been to the premises since I quit and it was indeed very nice to see them all again. After having a heavy lunch we proceeded to the sports and cycle shop in Karlskrona to buy brake pads and try to find a front derailleur for my bike. After searching for a while in their stock we eventually found one that we believe will fit my bike. It felt like a great relief to get my hands on one in the last minute before leaving Sweden. On the way to the cycle shop we passed the city library. Whenever we have been traveling somewhere and run into a library we have always paid a visit. This time we were in a hurry and had no time so we only took a photo outside. 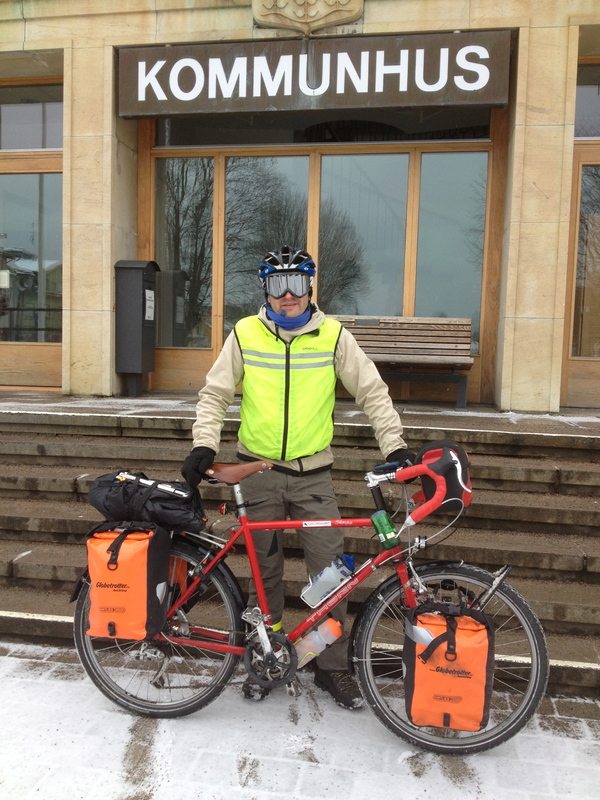 I guess this is only the first of a number of photos of Wej in front of a library in a city or town along our way. My coughing is still bad and we have decided to stay one extra day here in Karlskrona so that I can recover, mount my front derailleur and relax in the Spa at Karlskrona Varmbadhus. This entry was posted in Posts in English on February 26, 2013 by admin. I have been coughing for a a few days now and it worries me a bit because I don’t want it to get any worse than it already is. Yesterday’s ride was long and when I woke up this morning I felt weak and I coughed even more so we were happy that we only had a short ride today. Our host Ulrika left early and we had breakfast with her children, then we went back to bed to sleep some more before leaving. I don’t feel sick but I am quite sure it is a good idea to not push the cycling too hard and risk getting sick for real. We have plenty of time and there is absolutely no need to rush anything so we cycled really slow today. Today we chose the boring short road rather than the longer and more beautiful one. This meant riding beside the highway with lots of noisy traffic. 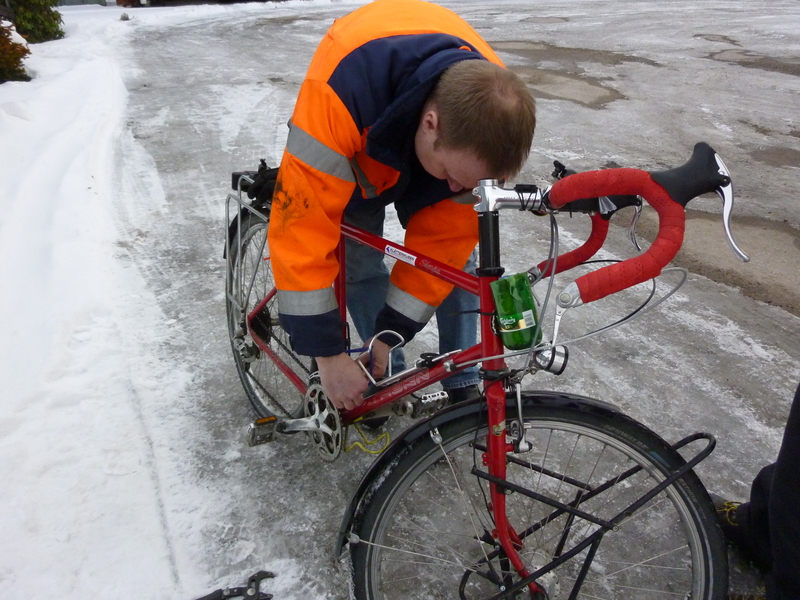 It also meant going on cycling paths were the snow had not been swept away yet. We had headwind most of the time but it was not as cold as yesterday. The only problem today was the seemingly endless little hills. Once we got up on one, we could see the slope down and the uphill section to the next hill. It was like some sort of roller coaster. This entry was posted in Posts in Thai / โพสต์ภาษาไทย on February 25, 2013 by admin. We expected headwind and surely got some but the road was really flat and we could move on at a rather high speed. After a while our feet got terribly cold and since it was a Sunday it took ages until we found something that was open, which happened to be once again a pizzeria, this time in Urshult. After a while we came to an intersection with a this road sign. It is probably the last sign for Göteborg that we will see on this trip. We surely don’t want to go to Göteborg, but the sign didn’t make it quite clear if we should turn left or right when heading for Bangkok. 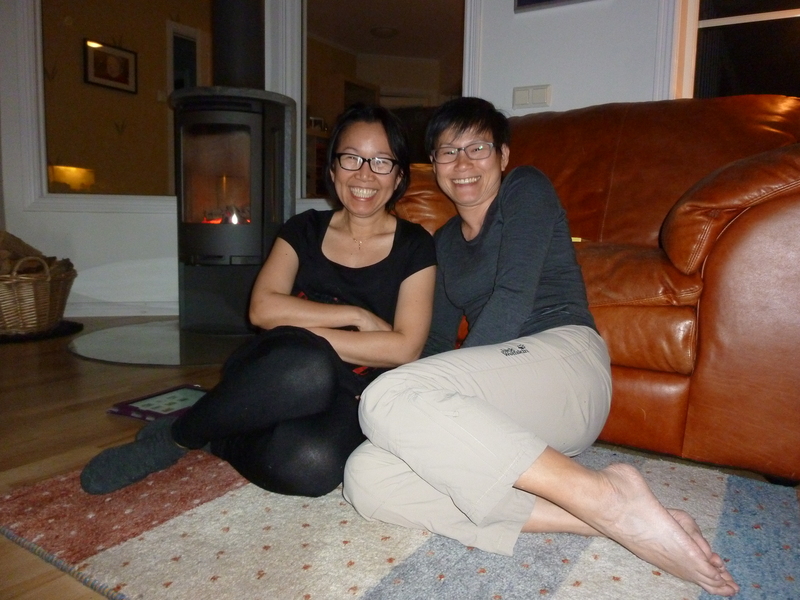 Our friend Ulrika in Bräkne-Hoby had invited us to stay the night at her house. When there was still 15 km to go it started to snow, heavily too. The road got all white and it was hard to see anything in front of us. When arriving in Bräkne-Hoby Ulrika and her children Tanya and Nicolai offered us hot tea and a lovely and spicy soup dinner. We sat up late in the evening and had lots of very interesting discussions while Ulrika baked bread for us to bring along today. One thing I really appreciate with slow travel is that there is no need to hurry to something else and instead focus of who or what is in front of you. 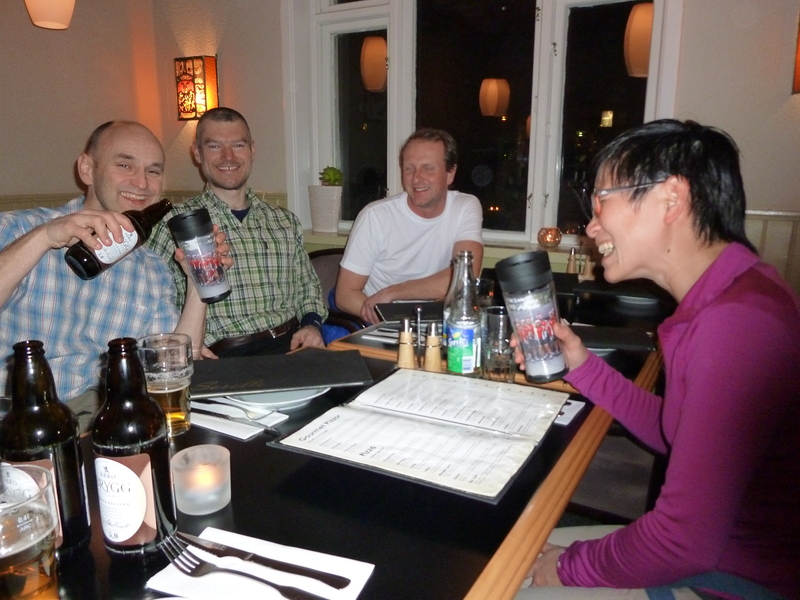 So Ulrika, Tanya and Nicolai – thanks a lot for a nice evening and a nice dinner. This entry was posted in Posts in English on February 25, 2013 by admin. We arrived to Älmhult one day earlier than we had expected which made us stay here for a total of 4 days. The rushed situation prior to our departure stressed us somewhat and these four days have been good for us. We have dealt with issues we had no time to deal with before departure and now we feel we are prepared to go for real. I have also met friends from Elmhult Sport Club. We went out to have a carbohydrate dinner and a few beers. They also gave us insulated drink bottles with a picture of our cycling team printed on it. It will keep our drinks warm now or cold later in the deserts. We will be proud to carry that towards Bangkok. We have also looked after our bikes. Apart from the normal cleaning of the drive train I have changed to a new front derailleur. Not a new one to be correct, but to a second hand one that used to be on an old bike that my friend Peter has but never uses. We tried to fit it on the bike standing outside in the freezing afternoon. It didn’t really fit so today I rode the 10 km to see Master Jürgen who can fix anything on a bike. Now my bike can use the two big chainrings and since it is still a long way to go until we run in to big hills I still have lot of time to find a derailleur that will allow me to change between all three chainrings. Thanks a lot Peter for the derailleur and thanks a lot Jürgen for attaching it and adjusting it for me. I have also paid a visit to the brand new IKEA store here in Älmhult. I didn’t buy any furniture, but I bought three plastic canisters to store food in. We won’t keep any food in them though – we will have tool and spare parts in one, cables and chargers in the other and we haven’t figured out what to keep in the third one yet. 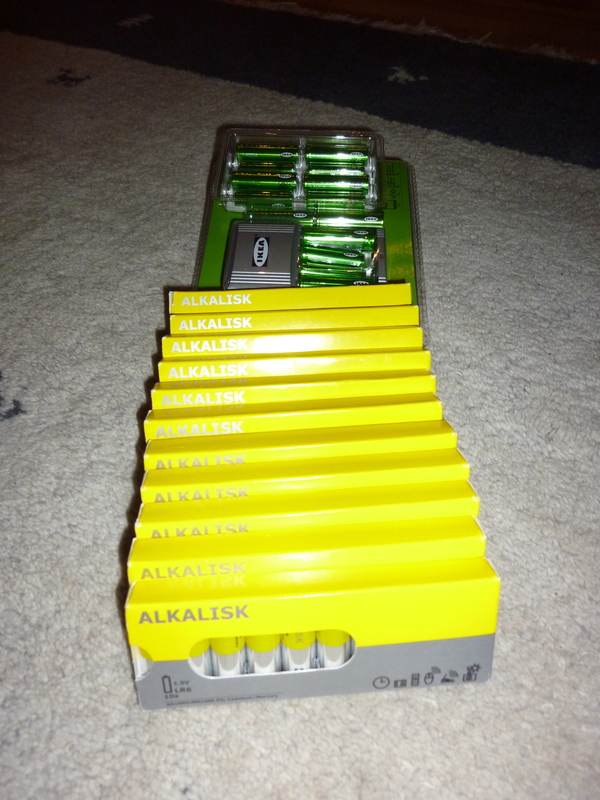 I also bought batteries – lots of them. Both rechargable and ordinary batteries. We now hope we will have enough power to keep our feet warm for many days to come. When I am writing these lines Wej is busy packing. We have had a couple of wonderful days here in Älmhult when we have got things done and seen lots of friends. We have lived with our long time friends Amporn and Henrik and their children Ninah and Jonah during our time here in Älmhult. We are so happy and grateful for being able to stay in their house and a nice time together. Jonah deserves a little extra thank you, since he gave up his room for us during our stay. This entry was posted in Posts in English on February 23, 2013 by admin. This entry was posted in Posts in Thai / โพสต์ภาษาไทย on February 21, 2013 by admin.